Which current Hawks could see their number get retired? It’s a question that I’ve often thought about over the last few years, especially since the Blackhawks won their second Cup in four years back in 2013: Which players currently on the Hawks’ roster could potentially have their number retired one day by the organization? There are a couple obvious guesses here, but then there are also a few names that seem to be on the bubble. So with that, let’s look at who may one day join numbers 1, 3, 9,18, 21, and 35. 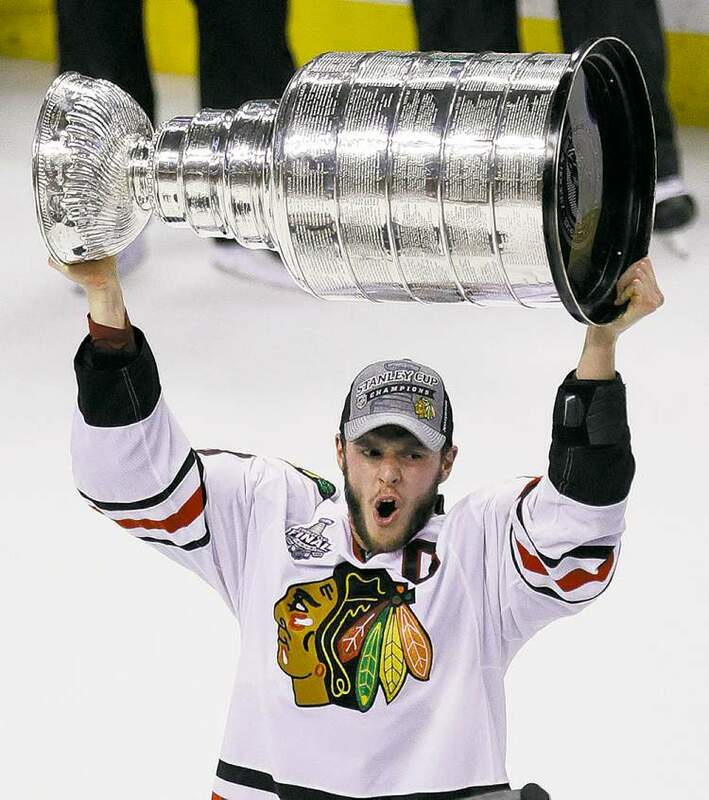 Jonathan Toews (19): You name it, he’s pretty much won it. Two Stanley Cup titles, one Conn Smythe, one Selke Trophy, two Olympic gold medals, team captain, etc. And odds are that he’s not done adding to his trophy collection. It’s almost mind blowing to think about what Toews has accomplished in his seven and a half seasons with the Hawks. At twenty six years old, he’s regarded as one of the games top three players and has earned as much respect league-wide as anyone. Statistically, he has 208 goals and 270 assists in his career in 527 games played. After signing the big contract extension with the Hawks this past summer, it’s quite likely that he’ll finish his career in Chicago and go down as maybe the franchise’s best player of all time. 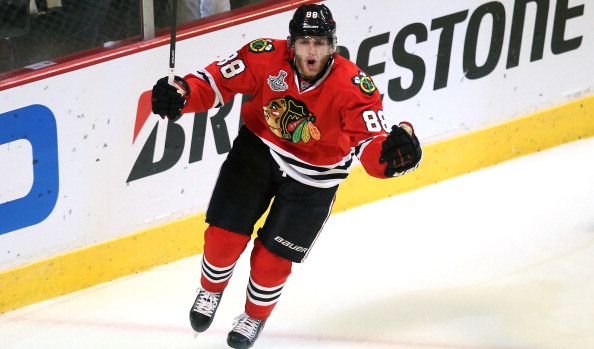 Patrick Kane (88): Kane won the Calder Memorial Trophy as the NHL’s top rookie player in the 2007-08 season to begin what has already been a remarkable career in Chicago. Since then, he’s earned two Stanley Cup rings and a Conn Smythe Trophy to go along with an Olympic silver medal. In his seven and half seasons in the league, he has amassed 192 goals and 342 assists in 558 games. Many around the NHL consider Kane to be the best American born player currently in the league, which would be tough to argue. Like Toews, Kane signed an eight-year contract extension with the Blackhawks this past summer ensuring that he’ll also probably play his whole career as a Blackhawk. And, like Toews, Kane could very well end up as one of the franchise’s top two players of all time. 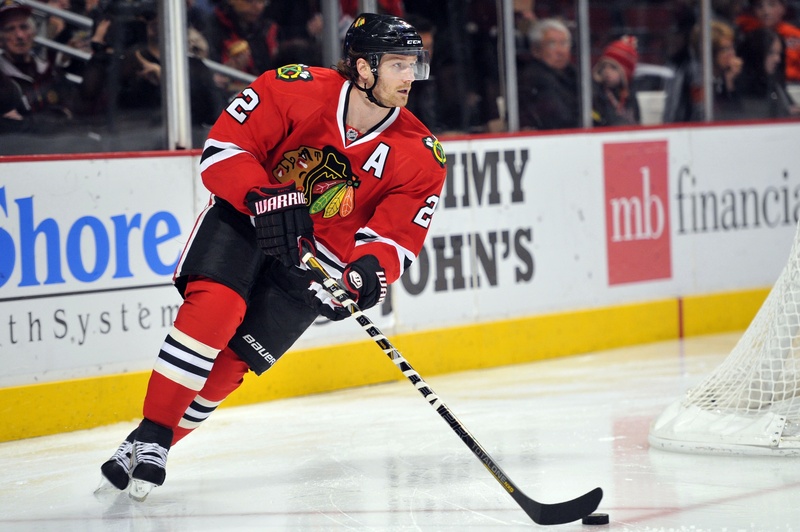 Duncan Keith (2): This one may surprise some people, but I don’t see how you let anyone wear number 2 after Keith retires. In his nine and a half year career with the Hawks and in the NHL, Keith has two Stanley Cups, two Norris Trophies as the league’s best defenseman, and two Olympic gold medals. He’s also been one of the team’s two assistant captains since 2008. Over his career, he has piled up 71 goals and 325 assists (396 points). To compare, Pierre Pilote, whose number 3 hangs from the United Center rafters, finished his career with 77 goals, 400 assists, and one Stanley Cup ring while winning three Norris Trophies. At 31 years old, Keith definitely still has some gas left in the tank and will quite likely pass Pilote in points. He already has more Cup rings, and he could win another Norris before it’s all said and done. Like I already said, I don’t know how you let another Blackhawk wear the number 2. Marian Hossa (81): Hossa is a future Hall of Famer, but spent the majority of his prime years with other teams. He has been a Blackhawk since the 2009-10 season and has earned 134 goals and 173 assists during that time. For his career, he has 473 goals and 553 assists putting him over the 1,000 point plateau. Since coming to the Hawks via free agency, Hossa has become a “core” member of the team and has won two Stanley Cups. He is one of the fan favorites for his style of play, talent, and respectability. You’ll have a tough time finding a player who works harder every shift he’s on the ice. He may be the game’s best two-way player, but he doesn’t get recognized for for it due to the fact that he’s not a center. 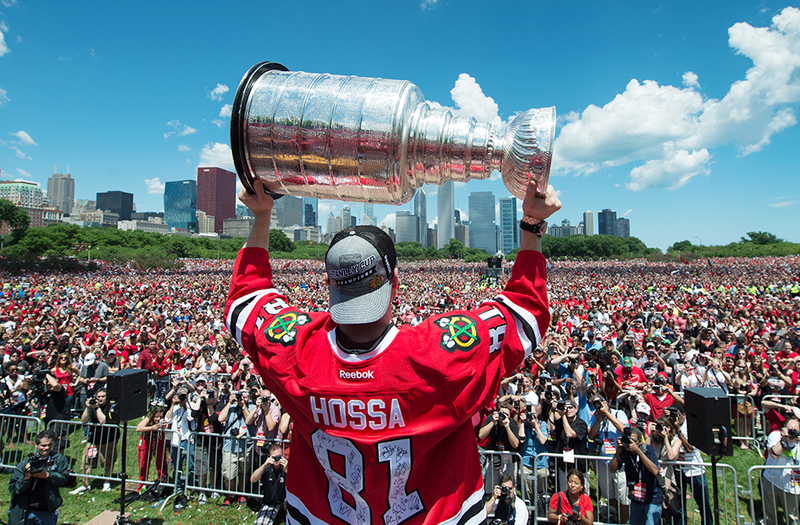 Because of his incredible career, the fact that he’s won his only two Cups in Chicago, and the way he plays the game, Hossa could ultimately end up having his number retired by the Hawks. 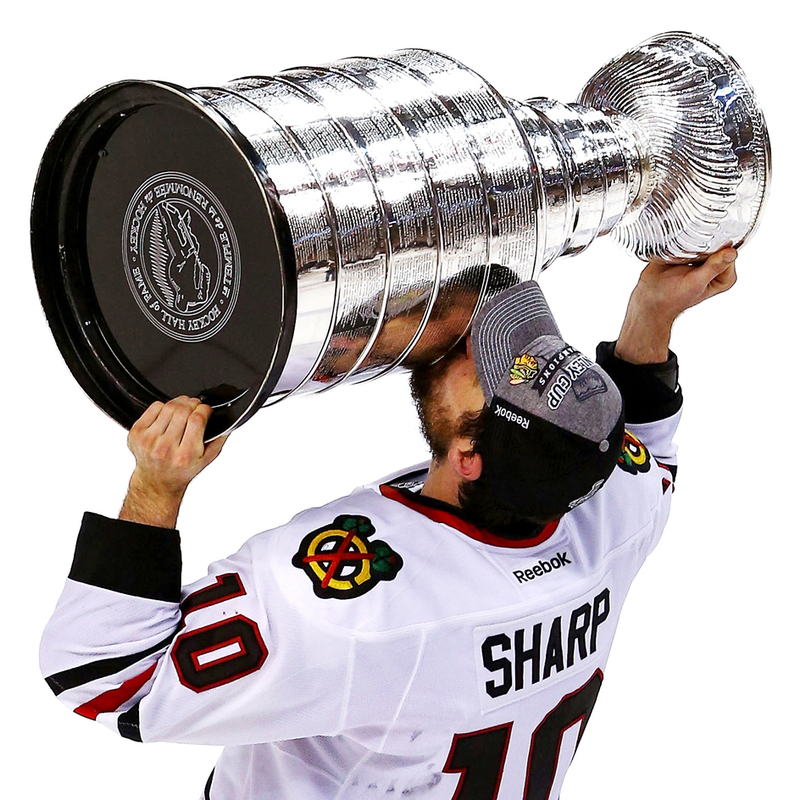 Patrick Sharp (10): Sharp started his career with the Flyers before getting traded to the Hawks in the 2005-06 season. He has since won two Stanley Cups with the Hawks and one Olympic gold medal. While his stats aren’t jumping off the page (242G, 262A), he has been a huge piece the the Blackhawks success in recent years. Along with Keith, Sharp was named one of the team’s two assistant captains in 2008 and has become one of the faces of the organization. His playoff production in 2010 and 2013 was a huge reason for the team’s overall success, as he led the team in goals both postseasons. This is a case of a guy possibly warranting consideration for having his number retired more so based off of his importance to the team rather than his individual statistics. Brent Seabrook (7): Seabrook has spent his entire career in Chicago. He entered the NHL along with Duncan Keith in the 2005-06 season and has been a fixture on the team since. Like the guys that have been mentioned before him, Seabrook was a member of both the 2010 and 2013 Stanley Cup-winning teams. He also won an Olympic gold medal in 2010. Seabrook and Keith have been the team’s top d-pairing for the past seven years or so, and have been widely regarded as the best defensive pairing in the league. 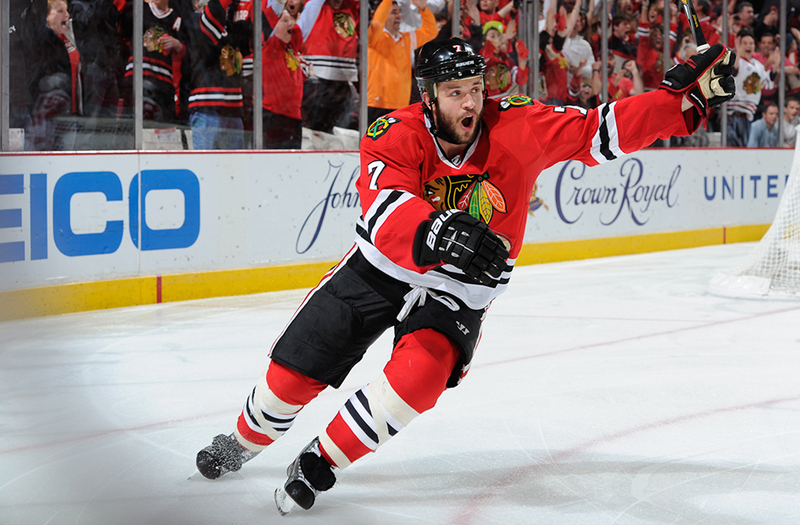 For his career, Seabrook has 70 goals and 239 assists. Those numbers are respectable, but they haven’t led to any individual accolades. While Seabrook is a long shot to have his number retired, the fact that Chris Chelios also wore number 7 as a member of the Hawks does not increase his chances. Chelios put up much better numbers, won two Norris Trophies, and was selected to seven all star games all while a member of the Hawks. Because of what each player has done in their careers with the Blackhawks, one would figure they’d have to retire number 7 for both Chelios and Seabrook, or don’t retire it at all. While this discussion is certainly up for debate, I feel pretty confident in my “Class A” selections. The fact that this topic is something that we can now talk about regarding the Blackhawks is truly amazing, given where the team and organization were not too long ago. 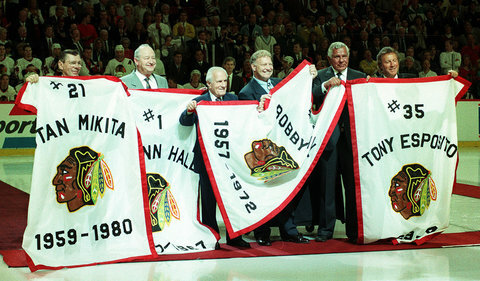 We should all feel very fortunate to be witnessing the Golden Era of Blackhawks hockey. The Blackhawks had been rolling along for the past month and half up until the Winter Classic came along. Over their past five games, including the Classic, the Hawks are just 2-3-0 and seem to be struggling to find the same energy that they had been playing with since late November. Call it the “dog days” of the season or whatever you wish, but the fact of the matter is that you cannot afford to lose many games right now as a member of the Central Division or Western Conference. The competition is too good, and the standings are too close. Over this recent stretch of games for the Hawks, they have looked out of sync. Take last night’s game in Edmonton for example. I’d say that for about two thirds of that game, it was a legitimate challenge for them to complete two passes in a row. Getting through the neutral zone with the puck proved to be as big a challenge for the Hawks, if not even a bigger one. On more than one occasion, the puck carrier for the Hawks and one of their linemates collided at center ice, causing either a turnover or a broken rush. Maybe even more troubling, and what may very well be responsible for the way they’ve been playing lately, is the fact that the Blackhawks focus doesn’t seem to be all there at the moment. In Minnesota on Thursday night and last night against the Oilers, it appeared as though the Hawks were simply going through the motions (unless their name was Brandon Saad or Marian Hossa). Granted they found a way to beat the Wild, but they couldn’t expect to have that same luck for a second straight game. As a result of their lack of focus and energy in Edmonton, they made the league’s worst team look like an above average defensive team. 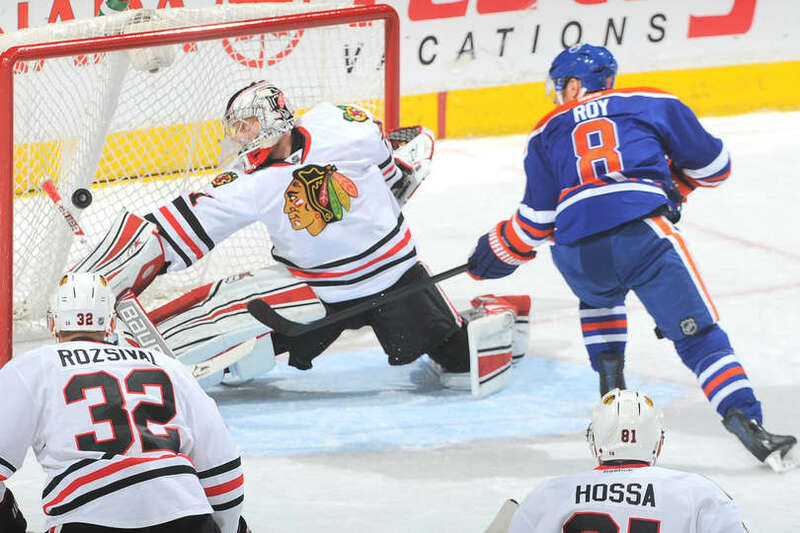 There is no way that the Oilers should have held the Hawks to just 21 shots in the game. No way. Yes the Blackhawks were playing in their second game of a back-to-back, but that’s still no excuse. A team with this much talent, this much experience, and this much leadership should not continue to turn in weak efforts like this, especially when they know that they can’t afford to lose many games while playing in the Central Division. Aside from their effort, or lack thereof, the goaltending has not been as good during this recent stretch as it was for most of the first half of the season. Corey Crawford was having an outstanding year up until he decided to take in a concert and *trip* on the steps, leading to a broken foot. Since returning from that injury, he’s let in some uncharacteristically weak goals and has struggled to allow fewer than two per game. In his defense, he did just turn in an outstanding performance against the Wild the other night in a win that Joel Quenneville labeled a “goalie win.” Crawford got the night off against the Oilers last night, so hopefully he’ll build off his last outing moving forward. Antti Raanta has had better days too. We’ve seen him go from having a great season to something reminiscent of what we saw from him last spring. His rebound control has been bad, and he’s beginning to let in some soft goals. He even said himself that his performance against the Oilers last night was “one of the worst games of [his] NHL career.” Credit him for recognizing and acknowledging the fact that he needs to be better, but the fact remains that he does need to be better. Despite this disappointing stretch for the Blackhawks, there’s no need to get too concerned right now. As I’ve said before, this team is too experienced and has great leaders and great coaches that won’t let this trend of weak play continue. I’m not saying they’ll turn it around next game or even the next, but they know just as we do that they need to win on almost a nightly basis to keep pace with the teams in their own division. When the going gets tough and the importance of the games increase, the Blackhawks have almost always risen to the challenge. I expect nothing different from this year’s team. Yesterday, the Blackhawks recalled their top prospect Teuvo Teravainen who has spent all year down in the AHL with the Rockford Ice Hogs. Teravainen is the Hawks’ top prospect and one of the more highly regarded prospects in the game. This will be his second stint in the NHL, as he was called up near the end of last season and played in three games. The reason for his call-up is due to the injury that Kris Versteeg suffered in the Winter Classic against the Capitals. Versteeg took a shot to his hand, left the game, and never returned. He is expected to miss about a month. Versteeg’s absence from the lineup will be felt, as he is having a very solid season thus far with 9 goals and 18 assists in 34 games played. His 27 points rank third on the team. Ever since Joel Quenneville united Versteeg, Richards, and Kane on the Hawks’ second line, that trio has been arguably the team’s best. With Versteeg now out, someone will need to fill the void left on the second line. As of right now, it appears that someone will be Patrick Sharp (let’s just take a second to think about what a luxury it is to promote PATRICK SHARP to the second line…). This “new” second line has all kinds of potential to remain the team’s best line, as all three players on it are highly skilled, veteran players. 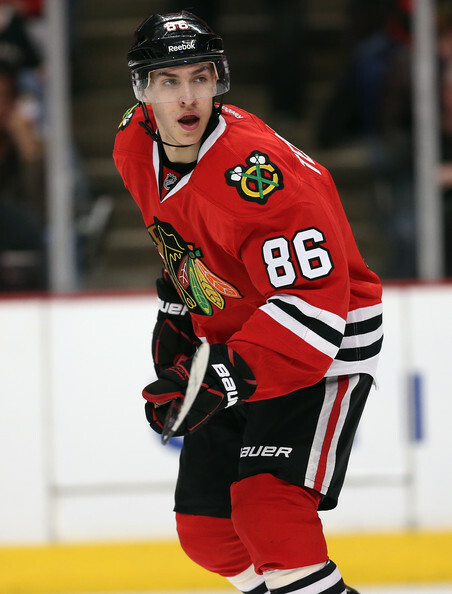 So what about Teuvo? If today’s practice is any indicator, he’ll be centering the fourth line in between Carcillo/Nordstrom and Smith. Not exactly the role that most fans would like to see him in, but it’s probably the smart decision at this point. You don’t want to put the kid into an important role that puts him under pressure to succeed. Placing him on the fourth line will limit his minutes, but it will also allow him to somewhat ease his way back into the NHL game. If he does well there, expect to see him jump up to the third line with Kruger going back down to the fourth. Right now really might be the best time possible for Teravainen to come back up to the Blackhawks. They currently sit near the top of the league in the standings, meaning they won’t be fighting for a playoff spot or desirable playoff position like they were the last time Teuvo was up. There isn’t much pressure on the Blackhawks to win every game right now, meaning less pressure on each individual player to play great every single night. Also, we’re entering what many consider the “dog days” of the season. This time of year, January-February, can become a drag for some teams, especially the good ones. With Teravainen coming up now, he’ll bring some excitement to the team, which they may or may not need at this point. Instead of looking at the next couple months as a boring, “let’s just get to April” part of the season, Blackhawks players might see this as the beginning of an era with Teuvo, who has all kinds of potential to be a lethal top six forward on this team in the future. I think a lot of people thought that the next time Teravainen got called up after being sent down last year, he’d stay up for good. Sort of like the Kris Bryant situation with the Cubs. With Teuvo coming up as the result of an injury to a Blackhawk player, his “staying up for good” might not be the case. That is unless he performs well enough to convince the coaching staff and management to keep him in the NHL. If that happens, then the Blackhawks will have added yet another highly skilled, potent player to their already loaded lineup. Of course, that would essentially mean someone would have to go from the NHL roster, but that’s a problem that we should all welcome. Teravainen will be making his season debut with the Blackhawks Sunday night at home against the Stars. Ironically, his debut last year was also at home against the Stars. I’d expect some butterflies early from him, but he seems to be in control of his emotions based on what we saw last year. Hopefully he plays well and gains confidence in his game. If that happens, this could be a late Christmas present to all of us Hawks fans, not to mention the organization.